Does anyone remember John Hughes, the director of those hit 80’s teen films “The Breakfast Club”, “Pretty in Pink” and “Some Kind of Wonderful”? Remember how they transcended the usual keg party, bong hits, and quest to get laid that characterized the other teen movies of that decade? 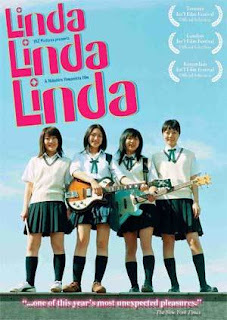 Well, most likely you do, so now I'll use the name of John Hughes to bring your attention another director who brings depth and sensitivity to a story about those awkward teen years: NobuhiroYamashita and his 2005 film “Linda, Linda, Linda”. The story itself is simple: a group of three teenage girls put a band together to perform a couple songs at their school's annual talent night. In the incestuous world of high school musicians they’ve all played together before, bassist Nozomi (Shiori Sekine) and drummer Kyoko (Aki Maeda) the most often, but when the original guitarist refuses to perform the girls find themselves in a bind. Solution: enlist a keyboard player, Kei (Yu Kashii), to take on the lead guitarist duties and then find a song to perform, and out of a box of old cassettes comes the 80’s hit “Linda, Linda” by the Japanese punk-pop band The Blue Hearts, but who will take the mike for lead vocals? Doing what any self-respecting rock act would do the girls pick the first girl that walks through the school courtyard: Son, a Korean exchange student (played by Korean actress Du-na Bae of “The Host”) who has no musical experience whatsoever. Perfect! What follows isn’t the classic formula of a teen movie, nor one of the many feel good comedy/ dramas coming out of Japan in the past few years (insert “Hula Girls” and “Swing Girls” here). Instead Yamashita brings us a gentle, episodic journey through the lives of these four girls, both as a group and on their own . We watch them jamming for hours in the music room, trying to get down the music of The Blue Hearts and having meals at each others homes, we see boyfriends, old and new, drift into and out of their lives, plus we get many hilarious scene stealing moments with Son like when she tries to negotiate her way into a karaoke club without buying anything to drink. All of this culminates in a final perfomance that will have you logging onto YesAsia.com to try and track down a Blue Hearts Best Of CD. Yamashita shoots “Linda, Linda, Linda” in lengthy unbroken mid to long shots, his camera occasionally focusing on the sky as we only hear the action going on. His original inspiration as a young filmmaker were the films of Takeshi Kitano and I could definitely see the comparison between this film and a Kitano film like “Kids Return”, but critics have also compared his films of down on their luck slackers to the Finnish director Aki Kaurismäki. Again it’s not a stretch to see the similarities, but in the end I like my own comparison (and probably the first of such comparisons) with John Hughes. “Linda, Linda, Linda” doesn’t show us the teens that we want to see up on the big screen; dating, partying, living out some strange fantasy of youth, but teens like we once were; insecure, excitable, angry, but in the end hopeful of what life they will start living after high school ends and those grown up days begin.